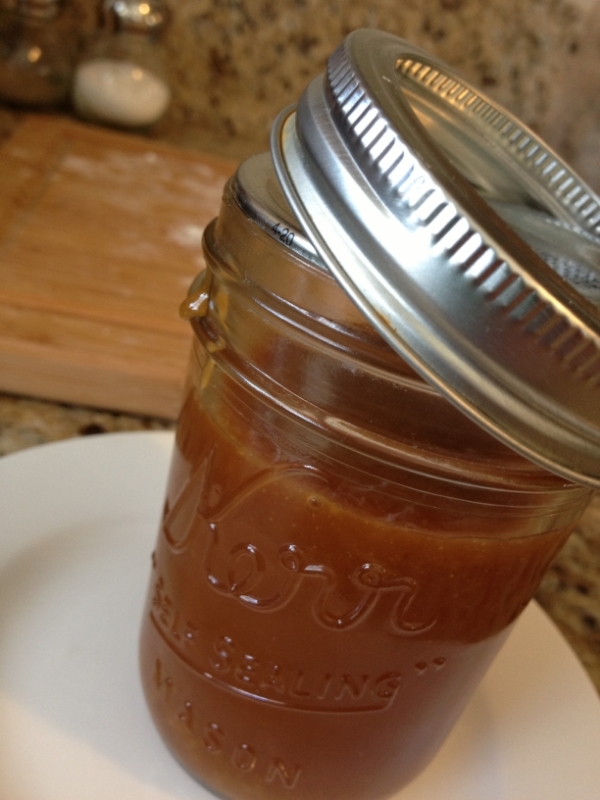 I've never made caramel before and let me tell you, this was a good one to start out on! It seriously tastes amazing! I didn't get any pictures of the process because you kind of have to keep your eye on it the entire time so it doesn't burn, but I'll torture pleasure you with photos of the end product thought the directions. Sound good? K. Here we go. 1 Tbs. fleur de sel or Maldon sea salt flakes. I just used regular 'ol salt and it worked for me. I only made a quarter of the recipe since it's just me and my husband and it made a small jar full so I'll leave that choice up to you. Step 1. 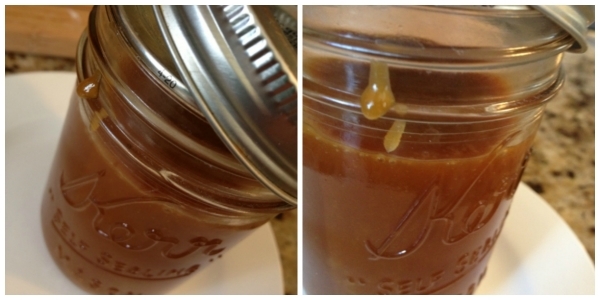 Get everything set up beforehand so that you can move quickly and avoid burning your caramel. Heat your sugar in the bottom of a 2-3 quart saucepan. When the sugar starts melting, whisk continuously. The sugar will clump at first, just keep whisking. When it's all melted, put the whisk away. You can swirl the pan to keep it from burning. Do this until it turns a dark amber color. If you have a thermometer, use it. You don't want it to get hotter than 350 degrees (Fahrenheit) or it will burn. Step 2. Carefully add the pieces of butter stirring until it all melts. Remove the pot from the burner and slowly stir in the heavy cream until it's all mixed in and the caramel is smooth. Step 3. Finally, stir in the salt and leave in the pot to cool for 10 minutes. Pour carefully into a jar and allow it to cool further before enjoying. Enjoy with some apple slices, cinnamon pretzels bites, or whatever else you enjoy with caramel. I'm pretty sure I could eat it plain. Store in the refrigerator. It should keep for at least a month, but In my house, I don't think it will make it past a couple of days. Give it a try and let me know what you think! What do you like to eat with caramel? This sounds so good. 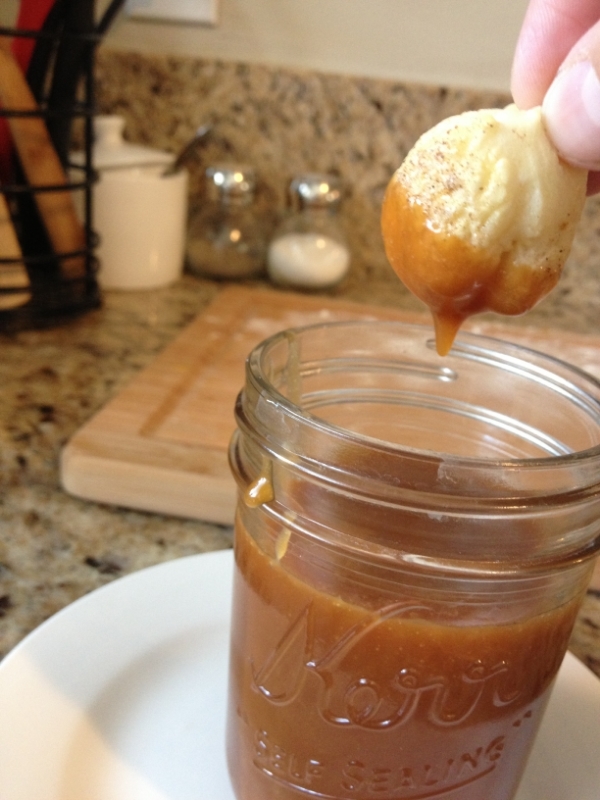 I've never made Caramel but this seems like something I could do. I will definitely be trying it out soon. My mouth is officially watering, this look so delicious! !